Do I need a flamethrower? No. Do I want one? Yes. That seems to be the general attitude behind the thousands of people buying Elon Musk’s new fire-breathing toy. If you haven’t been following, Musk promised to begin selling a flamethrower for his Boring Company – the one digging giant tunnels under LA – a few months ago. Now that they are up for pre-order, they’ve been selling like hotcakes. 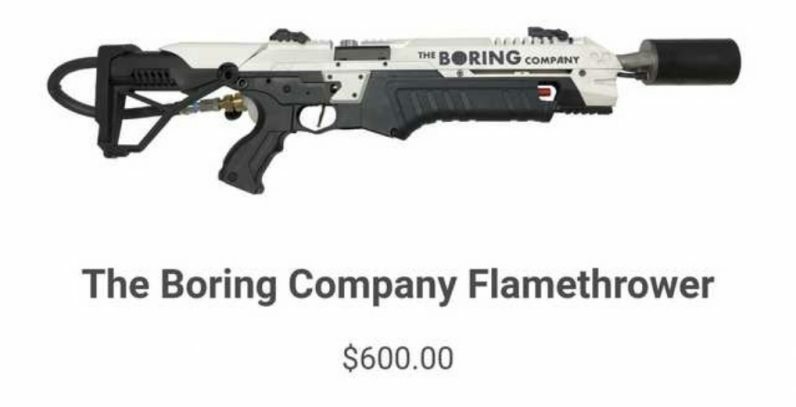 The Tesla CEO tweeted that there have been more than 10,000 flamethrower pre-orders, meaning sales of over $5 million so far (pre-orders originally cost $600, but now are $500). Who needs venture funding when you can make money selling flamethrowers instead? In all seriousness, 10,000 fire-breathing machines in the hands of people who don’t need one is probably not a good idea. But if you want to be prepared for the fight against the undead – you know, just in case – you can pre-order your own Boring flamethrower here.